You can turn any A-Frame or Lofted Shed into a true, free-standing garage by adding the Garage Package for $895! The Garage Package includes a beautiful garage door that looks and operates like a home garage door. This is not the cheaper roll-up garage door you find with other companies’ sheds! 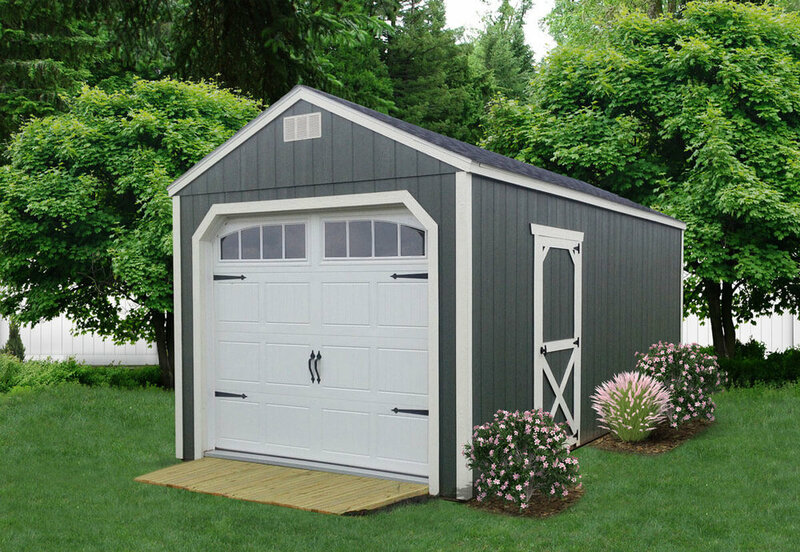 For added floor strength, the Garage Package ensures your building can handle the extra weight of your vehicle. The floor joists are built with 2'x6' floor joist, 16" on center and layered with 3/4” AdvanTech Flooring. The flooring is the industry leader in strength and stiffness and has an advanced moisture resistant resin technology applied through the panel. It comes with a 50-year limited lifetime warranty. You may want to order your garage with one of our 9x5 ramps that is made to work perfectly with these buildings! We have a standard garage door as well as a Carriage House garage door available. Each style has a variety of glass inserts available.